Yesterday was Cheng Beng, traditionally a day when prayers would be made to our ancestors. Some folks would take the opportunity to visit and pay their respects at the graves of those who have passed on, a custom which is known as “teh chuah“. Those who “piara abu” i.e. house ancestral tablets at home may also prepare offerings of food and welcome their “nenek moyang” for a feast. And that was what I did. Traditionally, chap chye is one of the staple dishes prepared in our home for ancestral worship but this year I’d decided to go for something similar yet different, and cooked Jiu Hu Char instead. 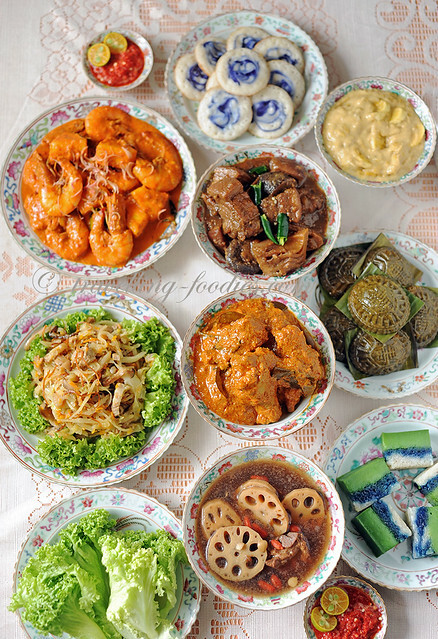 Apart from Jiu Hu Char, I also cooked a range of other dishes like pongteh babi, udang masak nenair and rendang ayam, which was also a substitute for the usual kari ayam for our house. Just try something different I thought to myself. I also cooked lotus root soup with spare ribs as it was one of my dad’s favorites. For the kueh chuchi mulot, I’d prepared apom berkuah chelop kuah pisang, kueh salat and the quintessential kueh koo hitam. Hope my late parents had enjoyed the spread, not forgetting the “monetary offerings” of kim zhua aka kertair mair after that. Why I’d decided to change the traditional chap chye for jiu hu char… well firstly the two dishes share quite a number similarities. 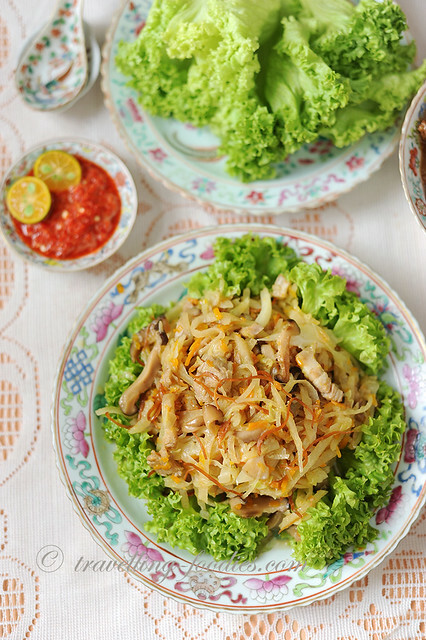 Ingredients wise, both dishes contain cabbage, chinese mushrooms and pork belly. They are somewhat a “stewed” or “braised” vegetable dish loosely put as the vegetables are cooked down until they are tender soft and sweet. For chap chye, the umami flavours are derived from the addition of tau cheo and prawns while in jiu hu char, the flavours of the sea are teased out from finely julienned dried cuttlefish. Jiu hu char contains carrots as well while traditional chap chye does not, though it has creeped into many modern interpretations of this old Peranakan Chinese dish as well as cooked by many and frankly speaking, i do not see why not as it does not dramatically alter the flavour profile of the dish. 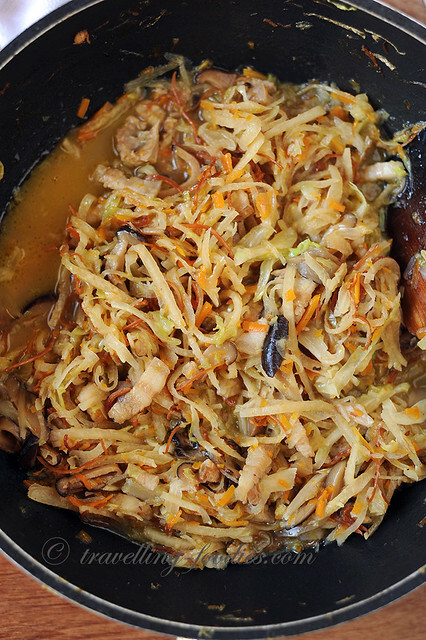 Jiu Hu Char is a testament of the knife skills of nyonyas in the past, much like nasik ulam. 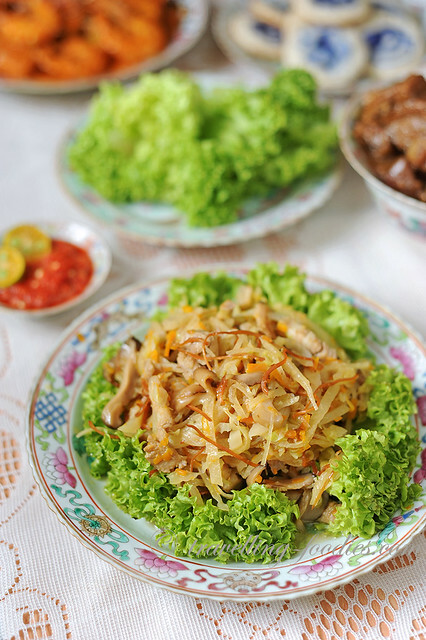 The assortment of vegetable ingredients have to be finely sliced or shredded as with the dried cuttlefish as well, to the girth of matchsticks. Thankfully, we can find julienned cuttlefish in many shops nowadays which saves one the hassle of doing so. But it doesn’t spare one of the necessity to process the other ingredients properly. I’d used my new Tramontina utility knife for that and it was a breeze to process the vegetables with it given how sharp it is. After processing the ingredients, I would say 70% of the work is already done as the cooking process is rather straightforward. That said, care must also be taken to ensure that the vegetables are properly cooked down to their very essence while retaining the necessary textures which makes this dish so so palatable apart from the rich flavour profile it is imbued with. The julienned yam bean/jicama aka bangkwang/sengkwang has to be cooked first after the initial sauteeing of the pork belly and shiitake mushrooms. This is because they take the longest to cook and soften to the correct texture. I used thick Japanese mushrooms which can withstand prolonged stewing. 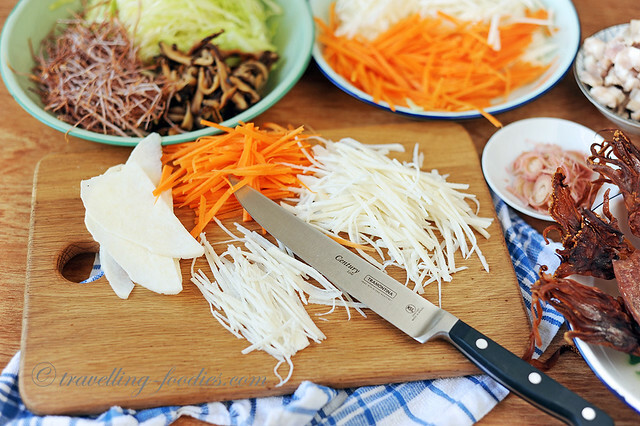 Only when the jicama is cooked down properly should the hard cabbage stalks and carrots be added, and finally the leafy portions of the cabbage. The recipe for the dish can be found here but note the details on the addition of the ingredients as described above. 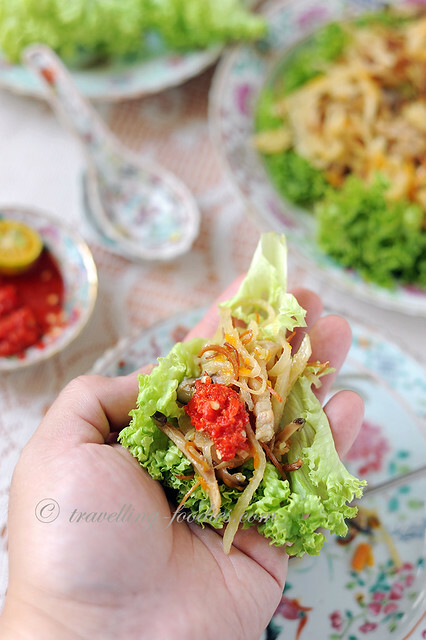 This entry was posted on April 6, 2018 by Alan (travellingfoodies). 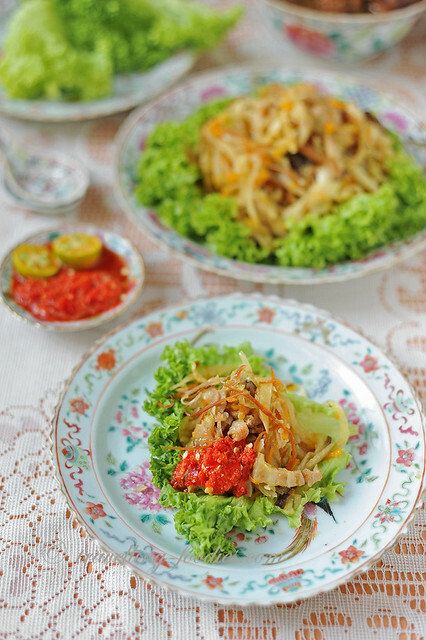 It was filed under Food, Simple Eats and was tagged with cabbage, carrot, chinese food, dried cuttlefish, jicama, jiu hu char, penang food, sambal belacan, yam bean.